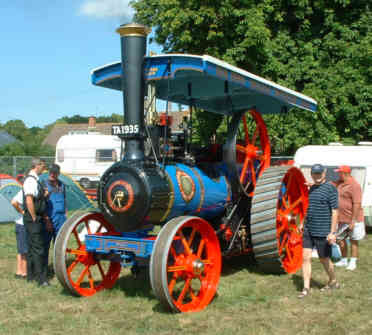 The Steam Fayre and Rally is organised by the West Somerset Railway Association and takes place at Bishops Lydeard, close to the WSR's station on the first full weekend in August hence its inclusion in this section of the site, there are more photos of traction engines and steam lorries on Road Steam. 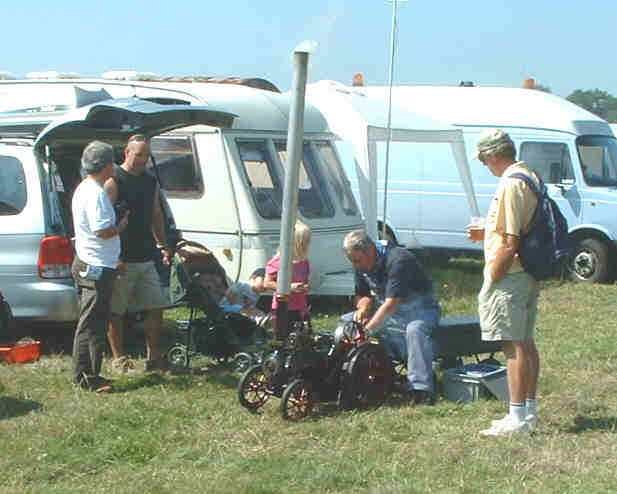 There is much more than steam at the Fayre though as you will see on this page. 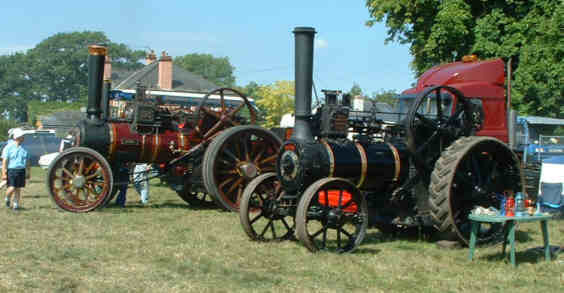 Two steam rollers flank a traction engine on the rally field, 3 of the 34 steam powered entrants. 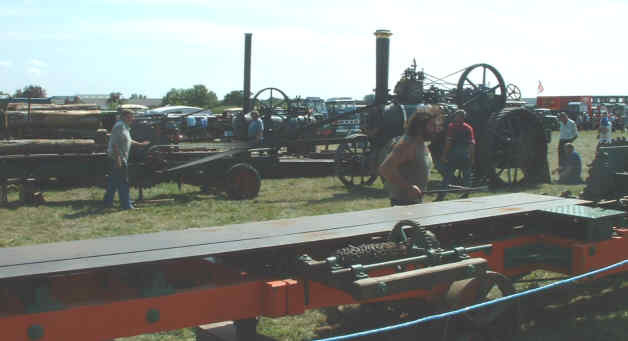 Two more traction engines awaiting their turn in the ring. 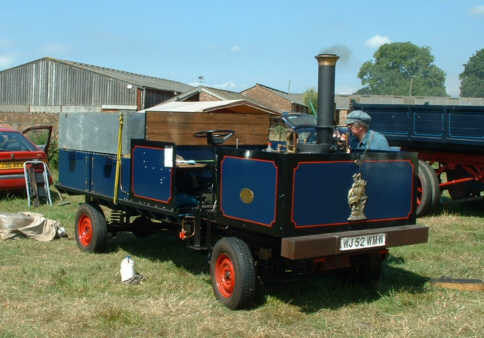 A 1903 Ransome-Simms & Jefferies 6nhp general purpose engine now owned by Ron Bond of Chard. 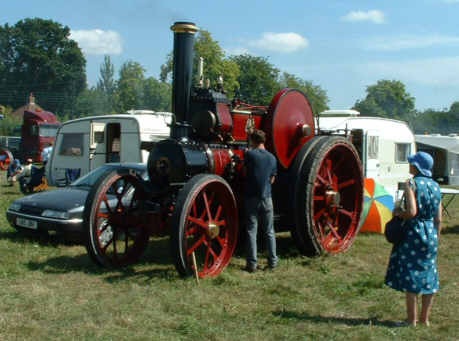 Another of the many engines being prepared for the show ring. 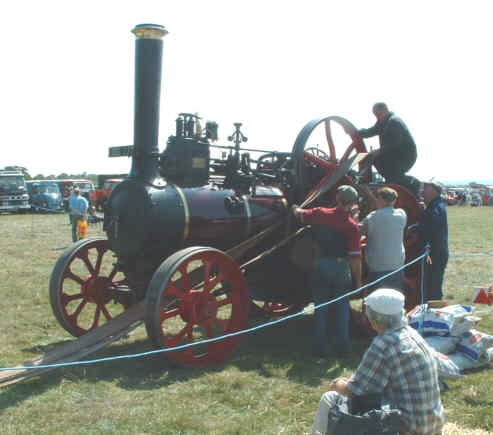 An 1870 Fowler 12 nhp ploughing engine, I believe this featured in Channel 4's "Salvage Squad" programme. 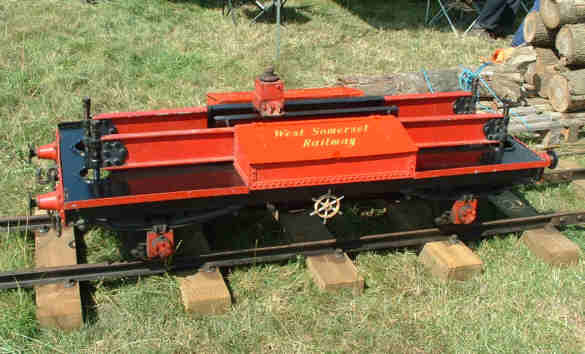 These engines worked in pairs, hauling a reversible plough to and fro between them using the cable which can be seen underneath this engine. 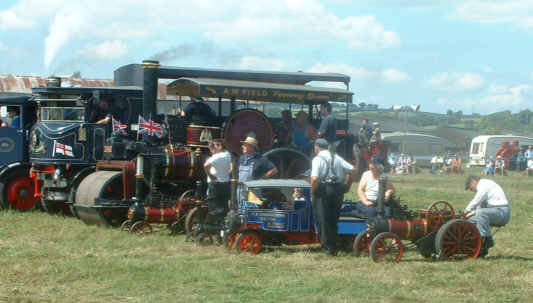 On to steam lorries and this line up with a Foden in the colours of the Cottage Brewery, a small Somerset undertaking. 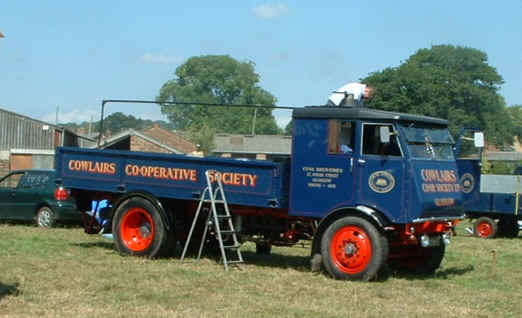 A better view of the Foden, advertising the brewery's Somerset & Dorset Ale. A modern steamer, this is a 2002 built Roanoke. After the Rally had finished I saw this on a trailer on its way home, still in steam! 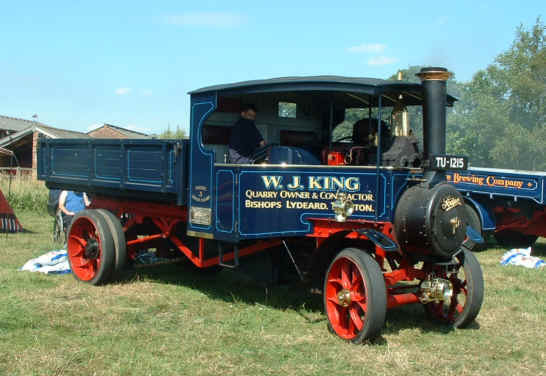 A 1921 Foden C type 3 way tipper in the colours of its original owners colours, those of local quarryman W J King. A 1934 Sentinel S4 steam wagon, new to Cowlairs Co-op in Glasgow who used it for coal delivery. 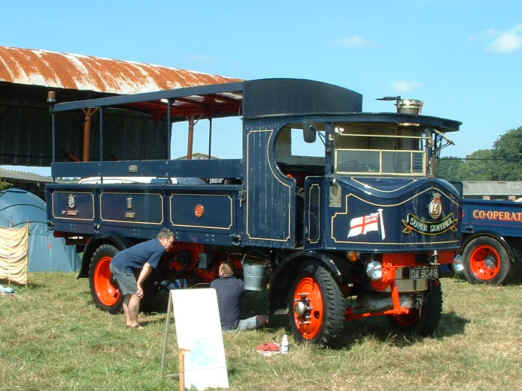 HMS Sultan's 1930 Super Sentinel steam lorry, operated as a self financing project by volunteers from the Royal Navy's School of Marine Engineering. 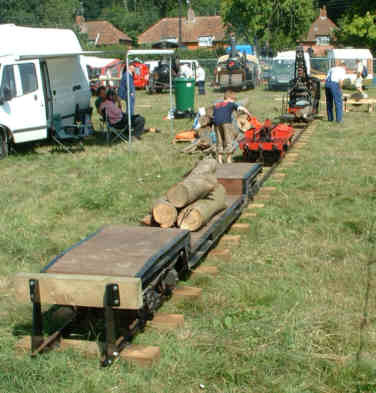 A fully working scale model of a Foden 3-way tipper getting steam up. 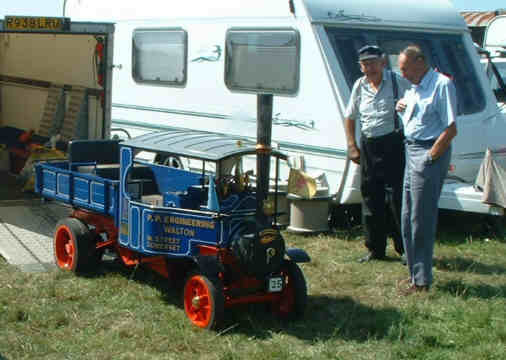 A scale model traction engine, the chimney extension is to increase the draught while raising steam. 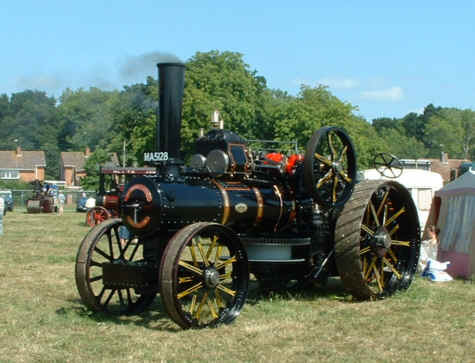 Another beautifully made working scale model traction engine. The grand line up of steam power in the ring, the variety of whistles and sirens they sounded off was amazing, some sound more like a destroyer! 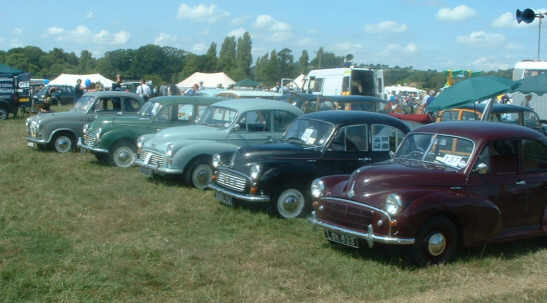 Not to be outdone by the full size ones the scale models joined on the end of the line up. Fitting the drive belt to a traction engine to connect it to a saw bench, a lot of heaving about was needed after careful positioning. The belt is twisted to cross in a figure of eight as this increases the contact area on the pulleys and hence grip - thanks to Tom Sharp for that piece in information. The saw bench the engine was being connected to and a view across it to another saw bench alongside. 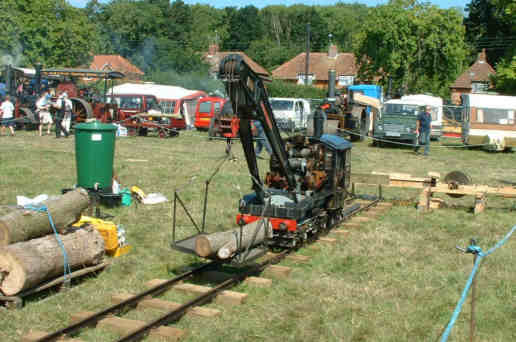 A railway exhibit, the West Somerset Railway has bought this 15" gauge steam crane and some track to take to shows as an exhibit. 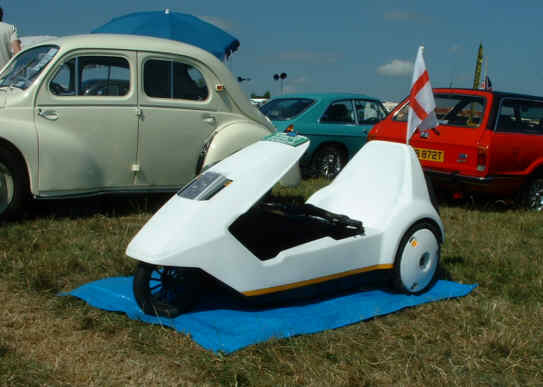 Between steam and petrol/diesel vehicles an electric one, how many of you remember the Sinclair C5? Not very successful, not least because sitting so low to the ground the rider would feel very vulnerable in traffic. 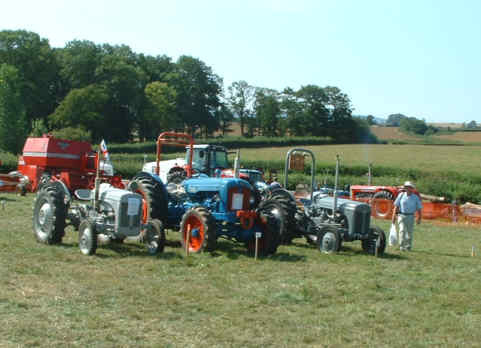 More utilitarian though slightly less modern, a variety of vintage and not quite vintage tractors. 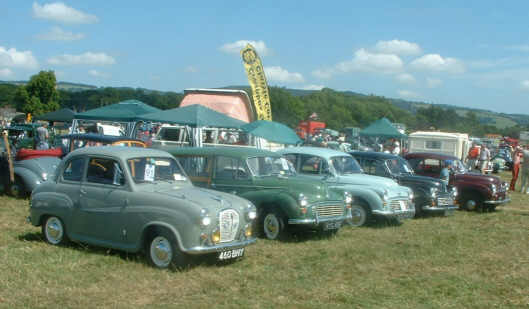 A pair of "Little Grey Fergies" flanking a Ford product. 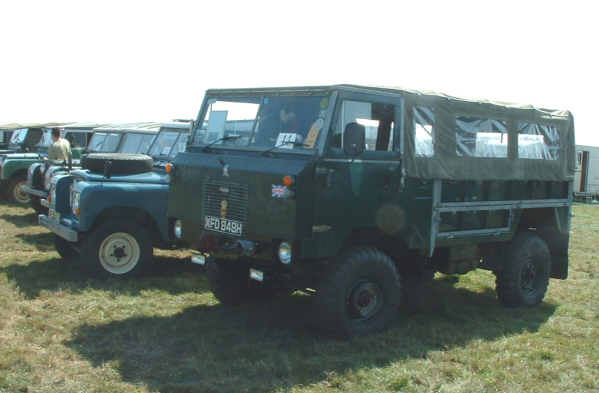 I was very tempted when I saw a Fergie for sale recently ! 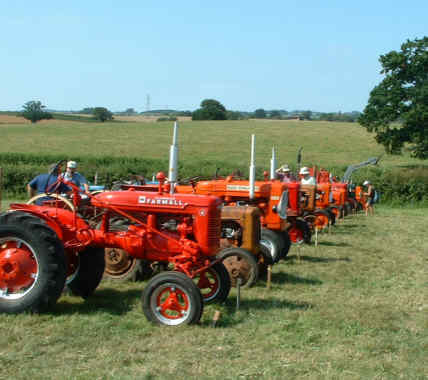 A line of red tractors including a McCormick Farmall and an Allis-Chalmers, reading the list of entrants it's amazing how many makes have disappeared over the years. 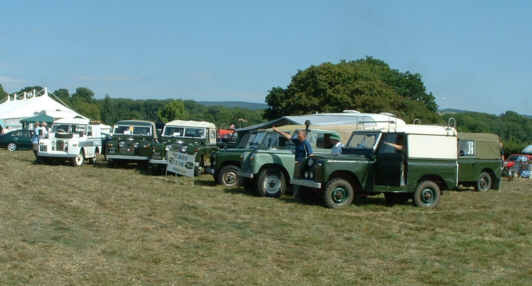 Only slightly less agricultural, the Land Rover section, including a rare forward control version in the right hand photo. 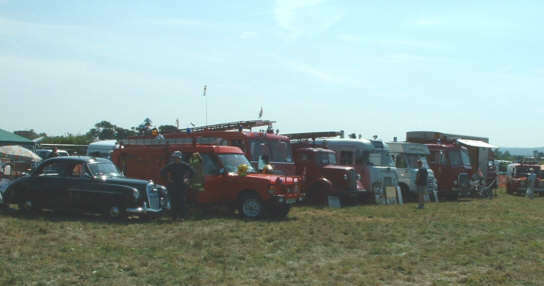 A variety of old lorries were in one section of the field, as with the tractors a lot of names from the past featured among the entrants. 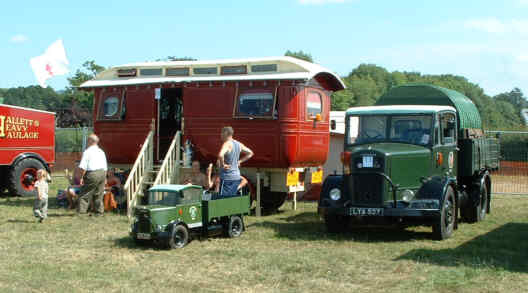 Among the lorries this Dennis with a miniature version of itself parked in front and what looks to be a showman's living wagon beside it. Near the lorries were the fire engines and police cars. 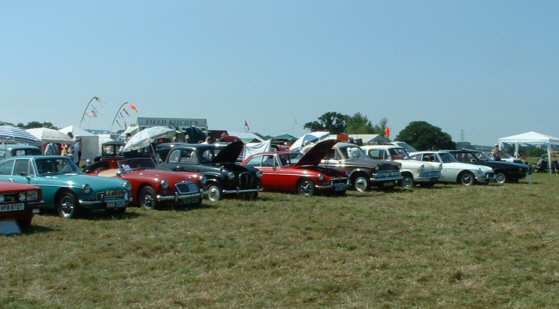 This variety of 1960's cars includes an MGA, MGBs, a Hillman Minx, an Austin A35 and a Ford Anglia and Capri. 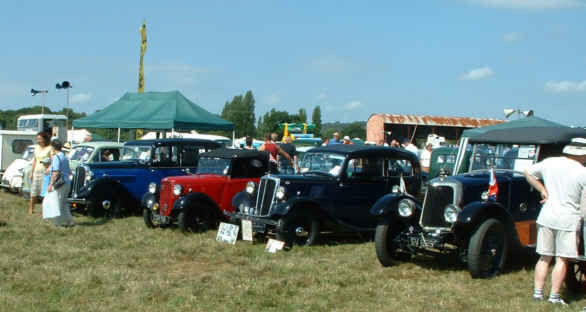 A selection of older cars including an Austin Seven which is also featured in close up in the second shot. 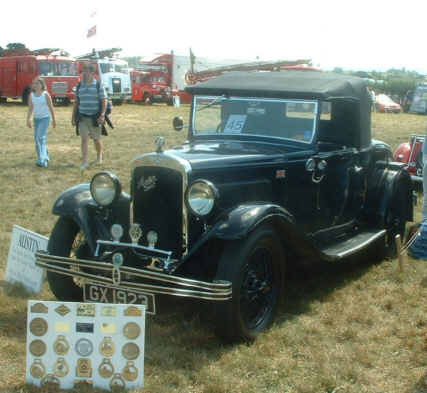 A 1932 Austin Eaton 12/6 which has evidently won many prizes at previous shows. It is a 2 seater with a dicky seat in the "boot". 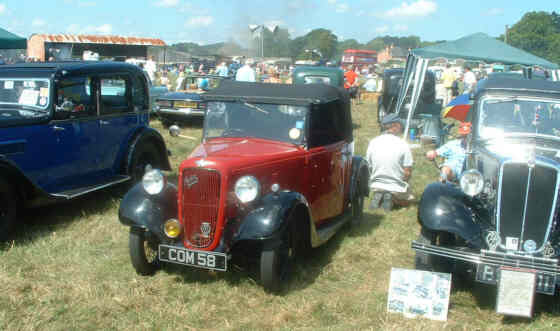 A cousin had a 1928 Morris with a dicky seat, was great to sit in there and look at the expressions of drivers behind you seeing people sat in an open boot! 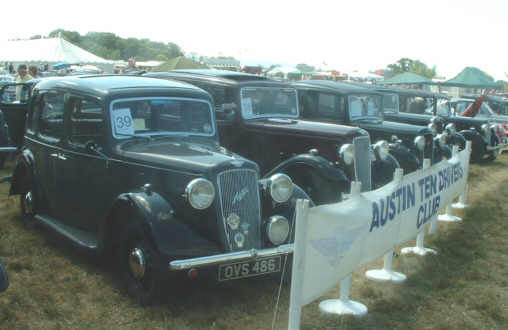 A line up of Austin Tens of various years from 1932 to 1938. 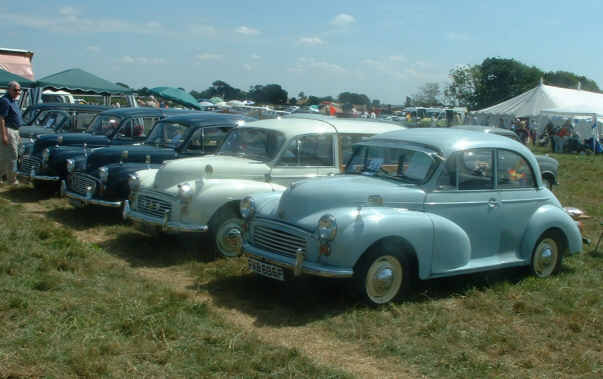 There were a fair number of Morris Minors in the Rally, an Austin A35 had crept in to one of these shots - but they were mechanically similar. 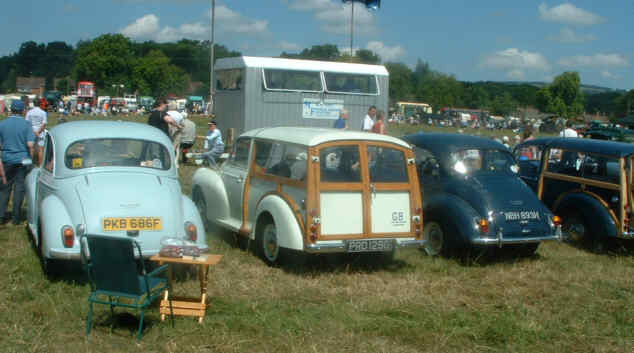 I learnt to drive in my father's Morris Minor, a girl friend had a van version... Many happy memories - wonder where Rose is now !!! 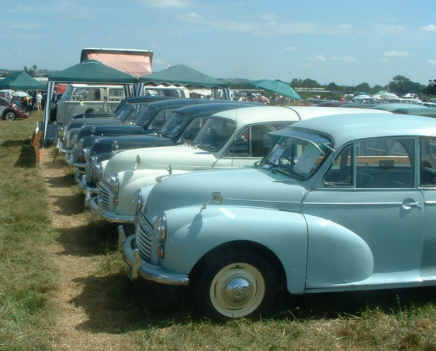 If you remember the district nurse in "Open all hours" one of these on display belongs to a former district nurse who used one on her rounds. A Triumph motorbike, chosen from the many bikes in this section because it's a bike I've always fancied - if you've read this far you'll realise I like some very different types of vehicle! Regrettably there was only bus entered this year, this ex London Transport RT, RT1594. 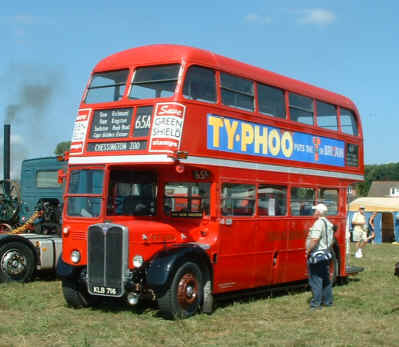 There were once some 7,000 of these in service in the capital. It is a great shame that so few buses enter the Rally, not sure why, if anyone can suggest what would change this let us know! 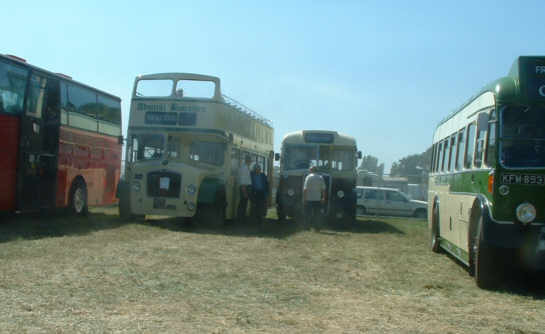 The bus interest was provided by Quantock Heritage, formerly known as Rexquote Heritage, a selection of their buses on the free shuttle to the station and on to Taunton can be seen here, including a Bristol LD open topper and an LWL. Photos not otherwise credited are ©2004 S G J Huddy. Other photos are included with permission of the copyright holders.